Explore the complete history of Boeing B-17F Flying Fortress 41-24521 known as "Black Jack" and "The Joker's Wild". Produced by acclaimed author Steve Birdsall. 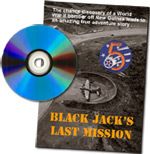 If you have an interest in adventure, aircraft wrecks, SCUBA diving or B-17s, you will enjoy this DVD.